The BoE’s first “super Thursday” has come and gone, with most of the commentary since suggesting it wasn’t quite so super after all. But I actually thought there was a lot of important messages from the press conference and supporting materials. I will go through my key takeaways below, but I thought it was first worth reflecting upon the market reaction across the afternoon. 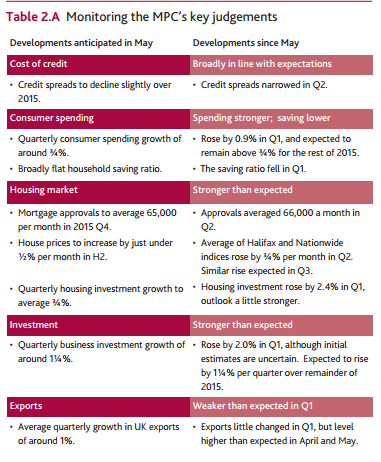 At noon the new monthly statement, minutes and Inflation Report were published. The immediate reaction was to the 8-1 vote. The market had been expecting at least 7-2, and so there was an immediate sharp rally in short sterling and sell-off in the currency. By the time the press conference was over at 1.45pm the rates move had almost completely reversed (the NY open saw a ED rally which muddied things a little) and sterling ended down only around 0.4%. This was a classic example of misunderstanding what the vote outcome meant for the policy outlook. No doubt if the vote had been 5-4 or even 6-3 that short sterling should have sold off, but in my view any other vote was little in terms of new information, as became evident in the press conference. So super Thursday injected a bit of intra-day volatility that wouldn’t have occurred under the old regime (as I had expected here). Carney said it several times in the press conference, and it also appears in the IR. Despite the stronger pound, higher path for market rates and weaker equity prices over the past three months, growth is actually very slightly stronger in the August IR. That reflects a stronger impetus to domestic growth from narrower credit spreads, small fiscal drag and lower oil prices. These comments make clear to me that the MPC remain on track to raise Bank Rate, sooner than they had expected in May, and arguably sooner than the market currently expects. Or a further steepening in the curve would be necessary. So while the growth and inflation forecasts, as well as the rhetoric were broadly in line with the expectations in my preview (here), the question for me is whether November is still on the table for a first hike? One factor that makes me think it has slipped to below 50% probability is that the MPC kept their downside skews to both growth and inflation, reflecting uncertainty about the pass-through of the stronger exchange rate. This was the key risk I had identified to my call on the timing of first hike. Had they removed the downside skew, I would have been more confident in sticking with November. But, on balance, I think February is now more likely. That still provides good opportunities to be short the front end in my opinion. 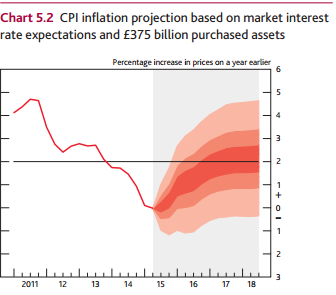 As outlined above, inflation is now expected to remain below target for longer than in May, before rising up to 2% within two years, and then slightly overshooting. The pick-up in inflation reflects the reducing impact of lower energy prices and higher sterling (which add around 1.5% to headline inflation) and the steady reduction in the output gap (which starts at around 0.5%, but is eliminated over the coming year as growth is expected to exceed potential) leading to stronger wage growth and unit labour costs. 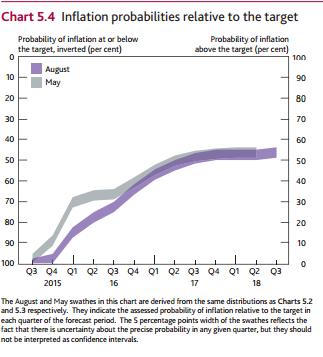 The chart below shows the inflation probabilities relative to target, with the overshoot in year 3. In terms of the growth news, the table below neatly shows the upside surprises across the demand components, with only exports disappointing. While on the supply-side, the surprise has been on somewhat weaker labour market quantities, the flip-side being stronger than expected productivity growth. More importantly, the upside news in weekly earnings, both including and excluding bonuses is key. If we see further upside in the coming couple of months, then a November hike may get more traction. 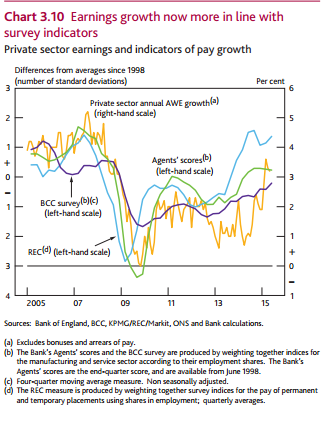 The IR notes that earnings growth has begun to move more in line with survey indicators, perhaps reflecting an unwind of compositional effects that had been holding it down (this was well telegraphed by the MPC) and increased labour market churn. 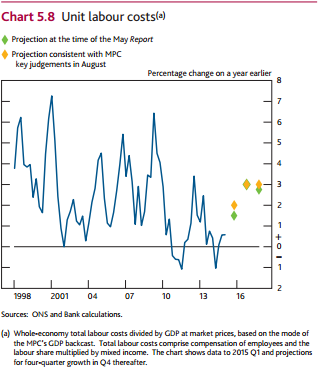 But that will need to translate into stronger unit labour cost growth (ie not simply reflecting stronger productivity) in order to get the MPC ready to hike. 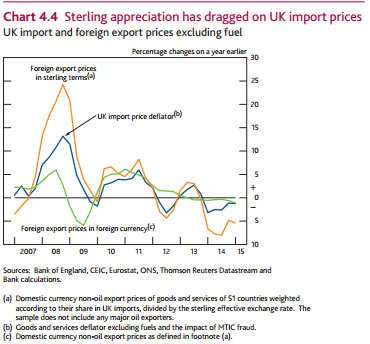 The first shows the impact of the exchange rate on import prices. It is significant, and therefore an important determinant of CPI inflation. What has been surprising though is the apparent reduced pass-through from the most recent appreciation. This has led the MPC to reduce the impact going forward as well. They have hedged this bet by maintaining the downside skew in inflation, but it is likely to be central to the debate over the coming months. 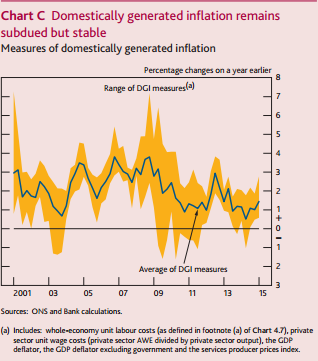 The second shows an estimate of domestically generated inflation. This is an attempt to measure the pace of ‘underlying’ inflation, and see if that reflects what you would expect given the view on slack. The average remains low, and while the Bank describe it as stable, you could argue that it has picked up a bit over the past year. It currently sits at 1.4%, somewhat above traditional core measures of CPI.